Enhanced Abilities: Chain has super human strength, agility durability and endurance. Enhanced Abilities: Sonic has super human strength, agility durability and endurance. Body Armour: Chain wears a suit of armour that provides some protection from physical and energy attacks. Body Armour: Sonic wears a suit of armour that provides some protection from physical and energy attacks. 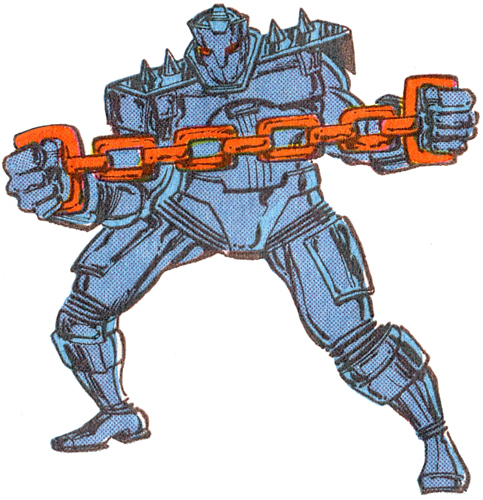 Power-Shackle: Chain originally wielded an electrified chain, or power-shackle, that could stun opponents. It has since been enhanced to be able to fire electrical blasts. Sonic Blasts: Sonic has a sound cannon on the chest of his armour that can generate intense sonic disruptions. Flight: Chain has Self propelled jet system in the boots his armour that allow him to fly at 150 m.p.h. Flight: Sonic has Self propelled jet system in the boots his armour that allow him to fly at 150 m.p.h. Chain is a member of the Seekers, a team that consists of three former A.I.M. scientists, they that have now gone freelance and have developed battle armour. One of the first team outings was to collect the bounty which had been placed on Spider-Woman's head.